Scalloped cast on, merged with a foundation base chain. Anyway, I’m going to post it as an extra post this week for crocheters. I can’t stand to either leave it in my draft posts or to delete it, because I think it’s beautiful. Be warned: I have a sneaking feeling there’s something wrong, or at least highly cryptic, about the instructions, but I can’t crochet to double check. It might be enough to get a skilled crocheter started? Notes that I wrote just before posting this are written in italic. 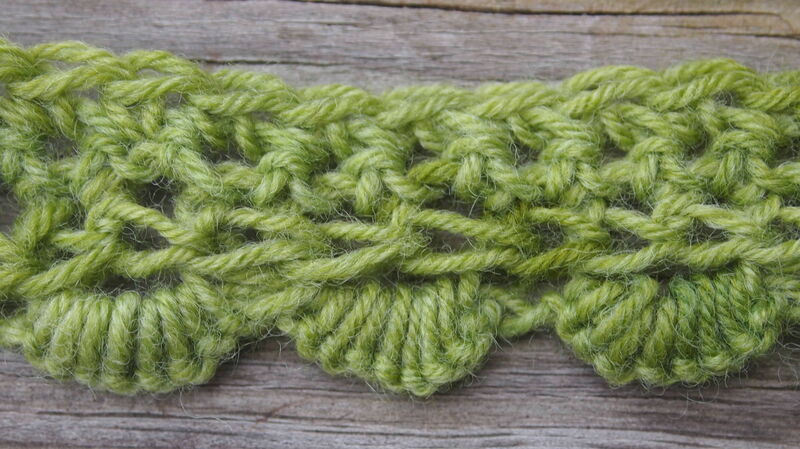 Start with the scalloped cast-on as shown so that you have half as many loops as you’ll need in the end. If I recall correctly, this particular version would be better done with a large knitting needle (circular, if you need a lot of stitches) in the place of the hook, and a small crochet hook in place of the knitting needle – it’s not Tunisian crochet. It’s a fancy knitted cast on combined with a foundation base chain. Chain two. I think starting from the last cast-on stitch that’s on the knitting needle? Work two foundation base chains. Work the first chain of another foundation base chain. Slip the next stitch of the scallops onto your hook. Yarn over, and pull through the first two loops on the hook. YO, pull through two loops. Repeat all of that to the end of the knitting needle. You’re welcome to comment with questions, but I can pretty much guarantee I won’t know the answers. However, maybe another commenter will be able to help! Although my hands/wrists are getting to the point that lots of crochet is a literal pain, I can get away with a little bit if I pay attention to how much I’m doing. And I’d love to try this out to see if I can suss it. I know my pattern confusion has helped you in the past (and I’m feeling really confused right now, in general ;D), so maybe it can help again! I’d love to see what you can make of it! Let me know if you do! I’d love to see the idea in use.